Invest in the World. It’s Yours, After All. – Love. Life. Practice. Invest in the World. It’s Yours, After All. So the story begins back in 2011, when Tanner McSwain decided he wanted to use KickStarter to start a new bookstore in Chicago. I was raised to love old wander-around-type bookstores, and at the time I had an extra $25, so I signed up. I don’t live in Chicago, I didn’t know if I would see it, but I enjoyed the idea of being part of something there in Logan Square. The Kickstarter made the funding, the bookstore opened, but I was in Pittsburgh. Or D.C. Or Seattle. Or any of many other places. 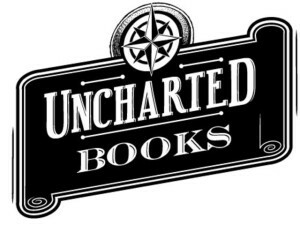 Occasionally I was in Chicago, but never with enough spare bandwidth to go to see how Uncharted Books was doing. As it happens, it was doing pretty well. They had to move a couple of doors down from their original location (leaky roofs and used books don’t mix to well) but Tanner had built a place that booklovers (and board gamers) enjoyed, exactly the type of old-paper-smelling hodgepodge of “Oh, I remember that book!” and “Oh, I’ve heard that’s a great one!” and “Holy cow, I never knew she wrote another one!” that bibliophiles dream of in this age of Barnes & Noble chains and Amazon Prime drones. Not that I have anything against either – B&N, before it was a chain, was exactly that kind of bookstore, and my parents used to give me $10 and an afternoon to see just how big a stack of books I could walk out with. But used bookstores like this – sole-proprietor, antique couch in the back, wood floors and brick walls – they are few and far between. A friend of mine from Seattle moved to Chicago recently (well, ok, months ago), and when we found we had time to meet up/catch up this weekend I suggested that Uncharted Books might be a good place to meet up. It’s near several great eateries (El Cid and Reno, for example) and I could finally see the fruits of my micro-investment. I walked in and Tanner greeted me with a smile and a handshake. I had planned on being incognito, but when he asked me what had brought me to his establishment I blurted it out: “I was one of your Kickstarters.” Suddenly I was an old friend, he told me about how the shop was doing, invited me to join him and his friends for board games, and invited me to enjoy his shelves. That last was especially an exciting find because it is conversations between Jean-Frances Revel (a French philosopher) and his son, Matthieu Ricard, a Tibetan Monk whose words have shaped my whole idea of what happiness means. In fact, I’m kind of thinking of giving it to my Dad when I’m done with it – both because he and I are not the types to have such conversations (“The Mormon and the Zen Guy” isn’t much of a book) and also because he was certainly instrumental in my love of reading. We’ll see – it’s a long book, I have time to figure it out. But the story doesn’t stop. My friend from Seattle and I had some good food, picked out our books, and then went for some coffee. After a lot of multi-level conversation (it’s great when one person says “At that point, it’s just turtles all the way down!” and the other person doesn’t even blink) the time came for me to do my writing. 1000 words a day, come hell or high water, and that in the middle of a pretty intense snowstorm here in Chicago. After a time at the restaurant, I realized I was milking my coffee and taking up valuable meal-eating-customer space, so I began casting about for a local coffee shop. A quick slog through the snow took me to the one the waiter recommended, New Wave Coffee. Their sign was brightly lit – but the cafe was empty, long closed. I slogged some more…heading the unshoveled blocks towards Intelligentsia Coffee, through the blowing snow…and then I saw that I was in front of Uncharted Books again. The light was on, warm and bright on the slushy sidewalk. Inside a bunch of flannel-clad friends played a board game, while customers browsed the shelves. I decided to take a chance, and went in. What do you think Tanner and co. said? That’s why I’m writing this, seated in the warm, dry, book-smelling back of the shop, listening to the happy gamers in front as I write out my work. I’m sitting in a place I helped create, from afar, never realizing that years later it would literally be shelter from the storm, and a welcome haven for my creative endeavors. Moral of the story: give way to your impulses to contribute to the world, in whatever way you can. The rewards will be both instantaneous and more far-reaching than you’ll ever imagine. You planted a seed for a spec of happiness in the world. Now you are enjoying the delight of watching how it grows. Planting seeds is definitely the way to go.